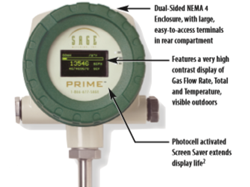 Sage Prime is the top selling meter in our Product Line. 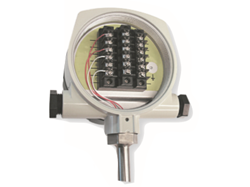 The Sage Prime Thermal Mass Flow Meter features a bright, high contrast, photo-emissive OLED (Organic LED) display of Flow Rate, Total and Temperature in a robust, yet lightweight, dual-sided NEMA 4 enclosure. The Flow Rate is also displayed graphically in a horizontal bar graph format. The rear compartment is completely separated from the electronics, and has large, easy-to-access, well marked terminals, for ease of customer wiring (see photo below). It is powered by 24VDC (12VDC optional, or 115/230VAC). The power dissipation is under 2.5 watts (e.g. under 100 mA at 24VDC). 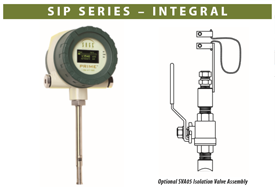 The Sage Prime Flow Meter is offered in Integral or Remote style (which has lead-length compensation up to 1000 feet as well as an Explosion Proof Junction Box). Specify any standard probe length or ﬂow body size. 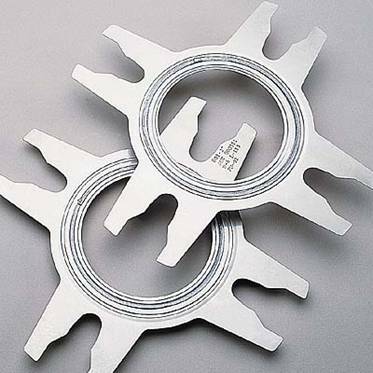 It has a 4-20 mA output as well as a pulsed output of Totalized Flow (solid state transistor drive). In addition, Sage Prime supports full Modbus® compliant RS485 RTU communi cations (IEEE 32 Bit Floating Point). Sage Prime is CE approved, and CSA, UL approved for Hazardous Service1 (see “Approvals”under the “Knowledge Base” tab on the website). For ATEX Zone I approvals, request Sage Rio Flyer (SIX Series). Sage Prime has continuous diagnostics. The raw calibration milliwatts (mw) is always displayed in the upper left hand corner of the meter’s display. At any time, you can check this reading at a “No Flow” (0 SCFM) con dition, and compare the reading to the original re ported “No Flow” value noted on the last few lines of your meter’s Certi ﬁcate of Con formance or the Flow Meter’s data tag. This in-situ diagnostic procedure not only checks the sensor performance and the “Live Zero” calibration point, but it also veriﬁes that the sensor is clean. It essentially provides a means to validate that the meter is oper ating properly, veriﬁes that there is no shift or drift, and eliminates the need for annual fac tory calibrations. This simple ﬁeld diag nostic procedure, in addition, veriﬁes that the sensor is free from contami nation, even without inspection. Although Sage Prime is fully conﬁgured upon shipment for the pipe and process cond itions requested, if changes are needed, SageCom™ software is optionally available for ﬁeld reconﬁgurability and performance validation and a printed report. Sage Metering is your source for monitoring, measuring and controlling the gas mass ﬂow in your industrial process, building management system or environmental application. Our high performance, NIST Traceable, Thermal Mass Flow Meters will help in crease productivity, reduce energy costs, maximize product yields, and/or help reduce environmental insult. Sage provides high quality In-Line and Insertion Thermal Mass Flow Meters for a wide variety of industrial, commercial, and environmental monitoring needs, including carbon credit veriﬁcation for Greenhouse Gas reduction. Our experienced application engineers, many of whom have worked in the Thermal Mass Flow marketplace since its inception, will assist you in choosing the proper gas Flow Meter for your application—and they will be pleased to offer installation guidance to assure that the meter(s) selected will perform as accurately as possible. Additionally, our Service Staff stand ready to support you with any after-sale assistance that you may require. Standard accuracy is +/– 0.5% of Full Scale +/– 1% of reading with a turn- down of 100 to 1 and resolution as much as 1000 to 1. Repeatability is 0.2%. NOTE: Enh anced accuracy optionally available with limited turn-down4. The electronics has an isolated 4 to 20 mA output proportional to Mass Flow Rate as well as pulsed outputs of Totalized Flow (24VDC solid state transistor drive6). In addition, Modbus RS485 RTU communications is standard (IEEE 32 Bit Floating Pt). Electronics is Integral style, with rugged windowed dual compartment NEMA 4 enclosure with local display. The display is a high contrast photo-emissive OLED display, and displays Mass Flow Rate, Totalized Flow and Temperature as well as a graphical representation of Flow Rate in a horizontal bar graph format. In addition, the calibration milliwatts (mw) is continuously displayed, providing ongoing diagnostics. Electronics is Remote style, with rugged windowed dual compartment NEMA 4 enclosure with display. The display is a high contrast photoemissive OLED display, and displays Mass Flow Rate, Totalized Flow and Temperature as well as a graphical representation of Flow Rate in a horizontal bar graph format. In addition, the calibration milliwatts (mw) is continuously displayed, providing ongoing diagnostics. Includes Remote Mounting Hardware. The Flow Element’s Junction Box is Expl Proof (Class 1, Div 1, Groups B, C, D), and does not have any electronics—only a wiring terminal block. The Junction Box is connected to the Remote Electronics by 25 ft of lead-length compensated cable. The cable (6-conductor) can be lengthened or shortened without affecting accuracy (max loop resistance 10 ohms, over 1000 ft), if grounded properly, at transmitter. This is an optional version of Sage Prime offering a separate ground for the 24VDC Power Supply (optional 5VDC or 12VDC Power Supplies) which isolates the Modbus ground from the power supply ground. All other features of Prime PLUS are identical to the standard Sage Prime, except Approvals do not apply at this time. The Fox Model FT2A, winner of both the 2014 Flow Control Innovation Award and the Processing Breakthrough Product Award, is the most widely versatile Thermal Gas Mass Flow Meter on the market today. The Model FT2A has a large selection of communication protocol options available intrinsically (without any other equipment). Options include: BACnet MS/TP, RS485 Modbus RTU, Profibus-DP, DeviceNet, or Ethernet Modbus TCP. The Model FT2A measures gas flow rate in standard units (SCFM, NM³/hr, LBS/HR, KG/HR & many more) without the need for temperature and pressure compensation. See the Features/Benefits section below to explore all that the FT2A can offer your application. FM and FMc approved for Class I, II, III, Div 2, Groups A, B, C, D, E, F, G, T4 hazardous locations; NEMA 4X approved; Remote NEMA 4X electronics enclosure with explosion proof sensor j-box. The Fox Model FT3, a multiple award-winning thermal gas mass flow meter manufactured in the United States by Fox Thermal Instruments. The Model FT3 was designed with our oil and gas customers in mind. This meter is Quad O (OOOO) compliant and is perfect for use in flare gas applications along with other fuel gas measurement. 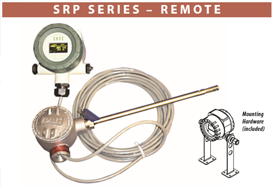 The Model FT3 measures gas flow rate in standard units (SCFM, NM³/hr, LBS/HR, KG/HR & many more) without the need for temperature and pressure compensation. Click the Approvals tab for Model FT3 Agency Approvals. Calibration Validation with the CAL-V™ and Zero CAL-CHECK® features.